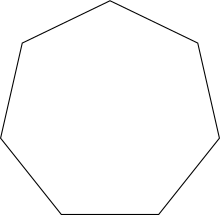 A heptagon or septagon or 7-gon is a shape with 7 sides and 7 corners. All sides of a regular heptagon are the same length. Each corner is 147.27°. All corners added together equal 6840°. This page was last changed on 27 April 2018, at 04:03.